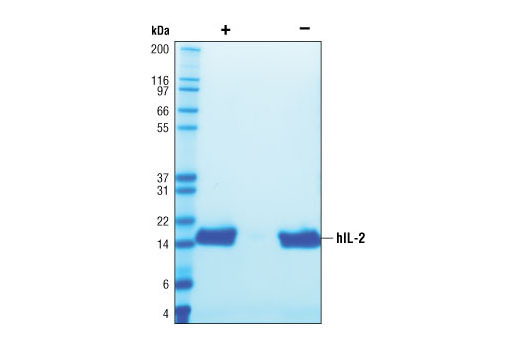 The purity of recombinant hIL-2 was determined by SDS-PAGE of 6 µg reduced (+) and non-reduced (-) recombinant hIL-2 and staining overnight with Coomassie Blue. The proliferation of CTLL-2 cells treated with increasing concentrations of hIL-2 was assessed. After 48 hours treatment with hIL-2, cells were incubated with a tetrazolium salt and the OD450 - OD650 was determined. 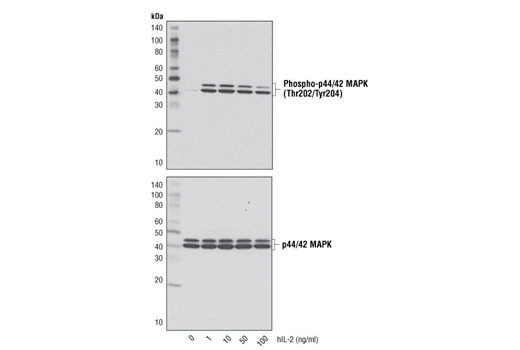 Western blot analysis of extracts from CTLL-2 cells, untreated or treated with hIL-2 for 20 minutes, using Phospho-p44/42 MAPK (Erk1/2) (Thr202/Tyr204) (D13.14.4E) XP® Rabbit mAb #4370 (upper) and p44/42 MAPK (Erk1/2) (137F5) Rabbit mAb #4695 (lower). Recombinant human IL-2 (hIL-2) Ala21-Thr153 (Accession # NP_000577) was expressed in human 293 cells at Cell Signaling Technology. >98% as determined by SDS-PAGE of 6 μg reduced (+) and non-reduced (-) recombinant hIL-2. All lots are greater than 98% pure. Recombinant hIL-2 contains no "tags" and the nonglycosylated protein has a calculated MW of 15,418. DTT-reduced and non-reduced protein migrate as 15 kDa polypeptides. The expected amino-terminal APTSS of recombinant hIL-2 was verified by amino acid sequencing. 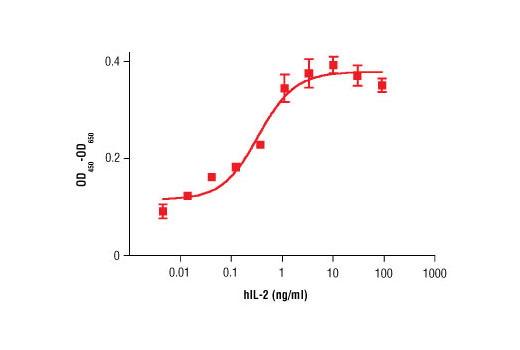 The bioactivity of recombinant hIL-2 was determined in a CTLL-2 cell proliferation assay. The ED50 of each lot is between 30-200 pg/ml. Less than 0.01 ng endotoxin/1 μg hIL-2. With carrier: Lyophilized from a 0.22 μm filtered solution of PBS, pH 7.2 containing 20 μg BSA per 1 μg hIL-2. Carrier free: Lyophilized from a 0.22 μm filtered solution of PBS, pH 7.2. IL-2 is a T cell stimulatory cytokine best known for inducing T cell proliferation and NK cell proliferation and activation (1,2). IL-2 also promotes peripheral development of Treg cells (3,4). Conversely, IL-2 is involved in activation induced cell death (AICD) that is observed post T cell expansion by increasing levels of Fas on CD4+ T cells (5). The effects of IL-2 are mediated through a trimeric receptor complex consisting of IL-2Rα, IL-2Rβ, and the common gamma chain, γc (1,2). IL-2Rα binds exclusively to IL-2 with low affinity and increases binding affinity of the whole receptor complex including IL-2Rβ and γc subunits. IL-2Rβ is also used by IL-15 (1,2). The common γc is used by other cytokines including IL-4, IL-7, IL-9, IL-15, and IL-21 (1,2). Binding of IL-2 initiates signaling cascades involving Jak1, Jak3, Stat5, and the PI3K/Akt pathways (1,2). Ma, A. et al. (2006) Annu Rev Immunol 24, 657-79. Gaffen, S.L. and Liu, K.D. (2004) Cytokine 28, 109-23. Fehérvari, Z. et al. (2006) Trends Immunol 27, 109-11. Antony, P.A. et al. (2006) J Immunol 176, 5255-66. Jaleco, S. et al. (2003) J Immunol 171, 61-8.